Check out this Diaper Changing Pad Portable Change Station for $14.77 (Retail $29.99). Planning on buying more? Make sure you click on the Applicable Promotions to see more discounts. ✅ READY, GRAB, GO TRAVEL CHANGING STATION - The NimNik Baby portable travel changing station is the ideal diaper changing station for on the move moms. It has everything parents need for a diaper change, to keep the little one clean, dry, and protected from dirty surfaces and germs. The NimNik diaper changing pad to go has plenty of storage for diapers, wipes and nappy bags. ✅ EASY TO CLEAN DIAPER MAT - The changing pad for baby is waterproof, just wipe off and you are ready to go. 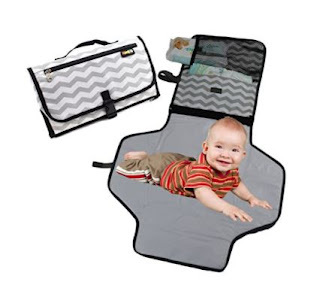 The diaper changing mat is waterproof wipeable &amp; washable, and large storage capacity making this the ultimate diaper changing pad portable mats for babies. The change table mat for babies measure 37" x 21" when opened providing plenty of room for your baby. ✅ ADD TO WISH LIST FOR BABY REGISTRY - The NimNik portable changing station clutch bag / infant changing station is coveted my moms to be, making this the PERFECT BABY SHOWER GIFT. The Chevron design makes a style statement which every new mom wants. The clutch changing pad makes a great gift.